Listen to the Land is a song that has stood the test of time with anyone who has ever heard it, regardless of whether or not you visited EPCOT Center prior to the attractions overhaul in 1993. For those that remember the original boat ride through the greenhouses of The Land, the opening segment known as Symphony of the Seed had lasting effects. From the oversized vines, fruits, and vegetables, to the lights that ran through them, Symphony of the Seed sought to simulate the life of the plants and how they grew. 1993 saw the removal of Symphony of the Seed and was replaced with Rain from the Past. While not as flashy or on the nose as Symphony of the Seed, the rain scene talks about how weather is a new beginning for plant life. With the rain washing away the loose dirt guests view the root systems of the trees and Living with the Land is able to discuss how those roots work to absorb nutrients and water to continue the growth cycle. 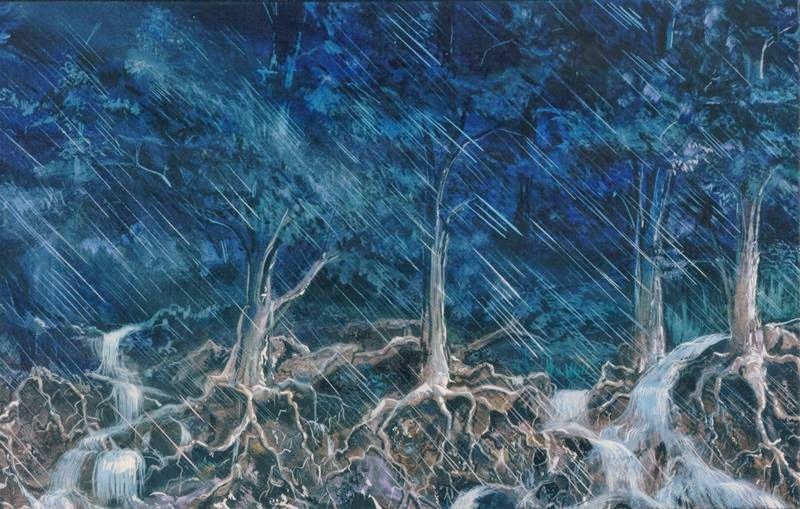 This concept art for Living with the Land shows the volatility of the storm. Exposed roots, rushing flood waters, and copious amount of rain being driven down by the winds are all present here. The rushing waters and exposed roots may have been built into the landscape of the attraction, but completing the torrential rains meant carefully placing and angling wires that could catch timed bursts of light. It’s a simple and time-tested effect, but it never ceases to impress me. If you ask me, Rain from the Past is simply the evolution of Symphony of the Seed.